Optometrists are primary health care specialists trained to examine the eyes to detect defects in vision, signs of injury, ocular diseases or abnormality and problems with general health. They make a diagnosis, offer advice and when necessary prescribe, fit and supply contact lenses or glasses. Some optometrists specialise in a particular clientele or type of treatment. undertaking continuing education and training. Why did you choose this profession? At the age of 12, I had my first eye examination and was amazed by all the equipment, lights and lenses. I couldn’t believe what a difference the spectacles made to my vision. It was such an eye-opening experience that I knew I had to pursue it. What training did you undergo? First, I studied Optical Dispensing at the University of Technology. It was a three-year diploma and I thought it would entail dealing with eye conditions, but it was more to do with choosing a frame and prescribing the lenses, tints and coatings. So, I decided to study further, which meant moving to Joburg or Durban. I went to the University of Johannesburg and studied for four years to obtain my degree in optometry. What type of personality is suited to this job? Someone who is passionate about people. You need to be patient, caring and compassionate, and you need to be highly motivated in order to deal with the everyday challenges that form part of the job. Is experience as important as formal training? They are equally important. You need the training in order to diagnose the relative eye conditions and your training is further enhanced by your experience. If you encounter a case that you haven’t dealt with before, it only challenges you to research, thereby extending your training. Describe a typical day on the job My main duty is to evaluate patients’ eye health and prescribe the suitable spectacle or contact lens correction. When I am not consulting, I’ll be answering the phone, calling patients, dealing with medical aids and accounts, conducting frame adjustments / repairs and checking stock. What do you enjoy the most? The ability to change lives by giving people the gift of clear vision. What’s been the highlight of your career? Whist I was a student, we visited rural areas and helped underprivileged communities who have never had spectacles prescribed; an experience I’ll never forget. Future goals? To extend my knowledge and open my own practice. I also plan to explore the world of iridology (the study of the iris). Any advice for people starting out in your profession? Have confidence in your training and have patience when dealing with patients. Keep up to date with eye-related technology. To qualify as an optometrist, it is necessary to obtain a Bachelor of Optometry degree at an approved university or technikon. This course of study combines theoretical learning and practical training. After which, graduates are required to complete an internship. 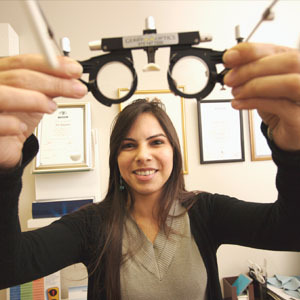 Training combines classroom instruction and clinical experience under the supervision of a licensed optometrist. Those who want to specialise in a particular area of practice will spend an additional year getting advanced clinical training. Optometrists are required to register with the Health Professions Council and Interim National Medical and Dental Council of South Africa before being allowed to practise legally.